Joining together Alexandre St-Onge and Pier Emmanuel Tremblay on an intimate 3″ CDr proves to be a rather good idea. 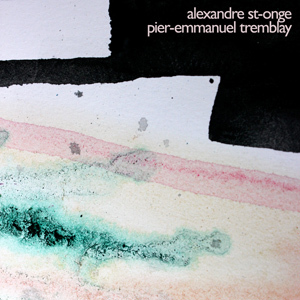 Although on first impression there is an acknowledgeable difference between Tremblay’s piano playing and St-Onge’s bizarre electronica, this contrast helps this nice split to grasp a firmer, wider grip over a surrealistic environment that hover somewhere between limbo that can be tasted through the first track, and the touching music of the next parts. This dreamy sequence in three movements begins the journey with alien sounds that start detached from each other and then slowly merges into one pulsing being. Made from these moist sounds that flirt with the idea of creating a soft melody, it then breaks into almost chaotic blend of music, not hard on the ear as much as it seems to approach it from different directions all at once. This all engulfing track changes to the short “Nostalgie Pour un Archipel”, a slow, melodramatic piano piece that is necessary as a very poetic transition between the other two tracks, which are more dominant. “L’appel du Large” closes the album with a complex piano piece that begins with a solemn state of mind, only to grow brighter with time. I think the last track is telling me a story, but then I realize the story had begun earlier with St-onge’s lovely music, and now it is just coming to an end. A slightly different offering from [walnut + locust], this split between Alexandre St-Onge and Pier-Emmanuel Tremblay is a small, beautiful token to appreciate, not unlike their other releases.